This product is for the already gorgeous dog in your family. 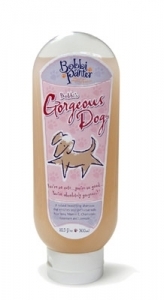 Contains natural ingredients such as aloe vera gel jojoba oil, rosemary, chamomile and vitamin E to enhance and enrich your dog's coat and skin. A slight peach fragrance leaves your furry friend smelling as good as they look. Ingredients: Deionized Water, Ammonium Lauryl Sulfate, Cocamidopropyl Hydroxysultaine (and) Aqua, Cocoamidopropyl Betaine, PEG-150 Pentaerythrityl Tetrastearate (and) PEG-6 Caprylic/Capric Glycerides (and) Water, Hydrolyzed Oat Protein, Glycerine, Lavender Extract, Aloe Vera Gel, Jojoba Oil, Tocopheryl Acetate, Rosemary Extract, Chamomile Extract. A small amount of preservative is required to protect our natural ingredients. Dilution: 20-1.